A deal to safeguard the future of a 169-year-old south of Scotland newspaper has been completed. 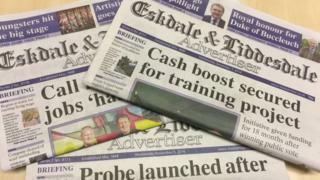 Carlisle-based CN Group has transferred ownership of the Eskdale and Liddesdale Advertiser to community interest company Muckle Toon Media. It was announced in November that the loss-making weekly title would close unless a new owner could be found. The Langholm-based community company will now run the paper with printing and publishing help from CN group. The new not-for-profit organisation was formed by local businessman David Stevenson and a small team. "We have just got used to local and regional newspapers closing and the increased emphasis about what's on Twitter, Facebook and the internet," he said. However, he said a chance meeting with two elderly women in the local paper shop convinced him of the importance of the publication to the community. Mr Stevenson described it as "high risk-low return" in financial terms but "high risk-very high return" for the community. "We set about working out how much money would be needed to fund it from the losses it is making at the moment to taking it up to break even," he said. "We think that is probably about 18 months to two years. "It really depends on the amount of advertising that we can raise - it lives or dies on that." For editor Rachel Norris and her two staff the deal brings to an end a period of uncertainty. "It is incredibly important, not only as a high street business on a small high street but it is a fantastic vehicle to get news out to people but also for people to share what is happening in their lives," she said. "All newspapers are seeing their circulations decline but we are kind of turning it around and going to the community and saying: 'What do you want? What would you like to see in the paper? What would you like to contribute?'." Mr Stevenson said he believed that whatever happened they would find a model to allow the paper to continue for years to come. "Papers like this are important, particularly to the older people," he said. "If you don't have communication, you don't have a community and the Eskdale and Liddesdale paper is very much part of that infrastructure. "We would lose a lot if it ceased to be there."